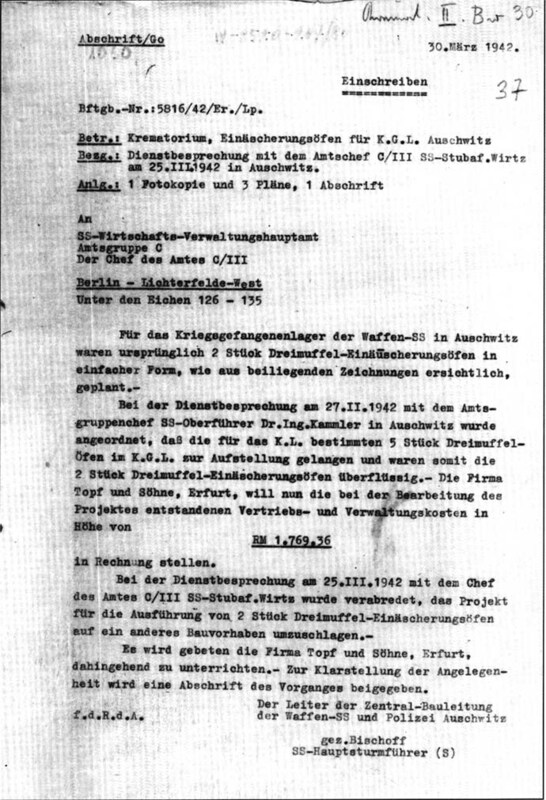 As shown air the enclosed drawings, two 3 muffle incineration furnaces incineration were originally planned for the Waffen SS POW camp at Auschwitz. During our conversation of 25/3/42 with the Head of Office C/III, SS Major Wirtz, it was agreed that the two 3 muffle incineration furnaces should be transferred to another construction project. We would therefore ask you to inform Messrs Topf & Sons of Erfurt. In order to clarify the situation we enclose a copy of this mailer.